Three weeks ago today, Philip C. Gale '98 died when he fell from a classroom window on the fifteenth floor of Building 54. His death left many questions unanswered. "It seemed liked so deliberate a suicide,"said Matthew S. Munsey '99, who came across the scene on his way home on March 13. "It really disturbed me. I felt like he was trying to send a message." Munsey, like others, is still searching for reasons. And amidst the rumors straining to explain why Gale killed himself lies the theory that the Church of Scientology, an organization which has met with controversy in the past, was somehow related. However, people close to Gale, including his mother Marie Gale, have vehemently denied that Scientology played any part in Philip Gale's decision. "Whoever is stirring this up is attempting to create strife in Philip's name when none existed,"said Marie Gale. Since the beginnings of Scientology, rooted in the late L. Ron Hubbard's 1950 book Dianetics: The Modern Science of Mental Health, the beliefs of the Church and the organization itself have caused debate. According to text by Hubbard, whose works form the codes and creeds of Scientologist belief, "We seek only evolution to higher states of being for the individual and for society." Critics "think it's mostly bunk," said Ronald S. Newman '79, himself a critic of the Church. Scientology is "controversial because its interactions with society are generally hostile,"Newman said. There exists "the perception that... they're a deceptive organization,"added Newman. "Ithink it's an organization that tries to manipulate the minds of its members." The Church responds by saying that "millions of Scientologists from literally all walks of life have attested to the positive benefits received from their religion." "Scientology makes people spiritually free and enables them to think for themselves," it adds. There have also been questions about the organization's tax exempt status, and the Church is currently waging a battle with the German government about whether the Church is a religion or a cult. The Church responded by noting that it has been judged a religion both by the Internal Revenue Service and by the U.S. Courts: "In 1993, the United States Court of Appeals for the Eleventh Circuit noted, after reviewing every decision on record in the U.S. and finding none that had ever concluded that Scientology was anything but a religion, that �no genuine factual issues exist to dispute [that Scientology is] a bona fide religion.'" Some past experiences have soured the mood at MIT towards the Church, however. Carlos M. Covarrubias '98 was living at the Pi Lambda Phi fraternity, next door to a chapter of the Church of Scientology in the spring of 1995 when he briefly joined the organization. "I was feeling lost at the time,"said Covarrubias, "Confused. "Among other things, "I had just changed my major." In a way, "Scientology is attractive. It's an escape,"Covarrubias said. "It's addicting; I was drawn in,"he added. "Near the end of the term," Covarrubias said, "they blundered." Without checking with Covarrubias, a high-ranking member of the Sea Organization, a group affiliated with the Church, "called up my parents" and told them he was leaving. His parents, who were unaware of his involvement with the Church, "were completely shocked." Covarrubias had been planning to join the Sea Org, but not so quickly. Covarrubias's parents made plans to visit him immediately, while his brothers at PLPcontacted ex-Scientologists to speak with him. Before his parents arrived in Boston, however, two Scientologists "came to help me pack," Covarrubias said. The brothers discovered the Scientologists and Covarrubias packing and confronted them. "They were blocking the doorway in the room,"recalled Covarrubias. "They weren't going to let me leave." Covarrubias's parents later arrived on the scene, and he went home with his parents and took a year off from MIT. "I would consider [Scientology] something to be wary of," Covarrubias said. "They're pretty good. You have to be persistent in order to get away� your life is channeled where they want you to go. You lose autonomy." When Covarrubias recently learned that Gale had ties to Scientology, he said that he was certainthat it was related to Gale's death. But friends dispute this claim. Gale did come from a family who had been active members of the Church of Scientology; his mother used to be the national spokesperson for the Citizens Commission on Human Rights, a group affiliated with Scientology. Gale also attended The Delphian School, an educational institution which uses works by Hubbard as the basis of its teaching philosophy. Early speculation about Gale's death was prompted by the fact that March 13 is L. Ron Hubbard day, the birthday of the founder of Scientology. "Suicide may have been a way to escape from Scientology,"Covarrubias said. "There were plenty of other things he was thinking about at the time,"Munsey disagreed. "The fact that he chose that day to jump is not necessarily significant; he would have seen the connection with L. Ron Hubbard day, but wouldn't have cared." 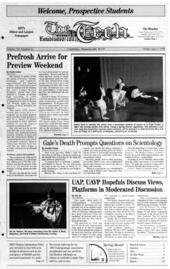 In a post to a Usenet newsgroup, Marie Gale suggested that Philip Gale's death might have been because of attacks on the religion he grew up with.Prior to his death, Philip Gale had been interviewed by a reporter with theBoston Herald for a five-part series entitled "Scientology Unmasked." "Ihad an upbeat conversation; Philip made it clear to me that he wasn't a practicing Scientologist,"said Joseph Mallia, the Herald reporter who wrote the series. "I would consider it very straight. I don't really know what to say about that post." People close to Gale assert that Scientology did not play a role in Gale's death. Eric Hu '98, a good friend of Gale's and his roommate at Phi Sigma Kappa during their freshman year, said that Gale's suicide was unrelated to Scientology. "Phil had given up Scientology by the timeI started rooming with him," Hu said. "It wasn't on his mind when he died� [because] it was a struggle he already overcame. He had decided against it." Hu said that none of the struggles in Gale's life were related to Scientology. "His struggles at the time of death had more to do with the possibilities of his life," Hu said. "I'm certain that his decision to end his life had little, if anything, to do with Scientology,"said Christine C. Hrul, a close friend of Gale's and a student at Wellesley. "Idon't believe that anyone close to him had considered the connection seriously... His Scientology background never played a frequent role in our conversations," she said. Gale's family members also denied any link. "I am a member of the Church of Scientology and have been since well before Philip was born,"Marie Gale said. "Several years ago Philip decided that Scientology was not for him - nor was any other religion. Ihonored his decision and he honored mine and the difference in our choices was never an issue in our relationship," she said. "I don't know of any indication that Scientology had anything to do with it," said Robert M. Randolph, Senior Associate Dean of Undergraduate Education and Student Affairs. "While I am a Scientologist, I am a mother," saidMarie Gale, "and my son, whom I loved and respected and, more than anything, wanted to be able to achieve his goals in life - whatever they were and wherever they took him - is gone." Though Philip Gale might have left behind some parting thoughts, he also left behind a puzzle which may never be fully solved.